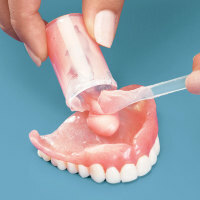 Services - Meeting all your denture needs. All services for dentures are completed in our onsite laboratory. 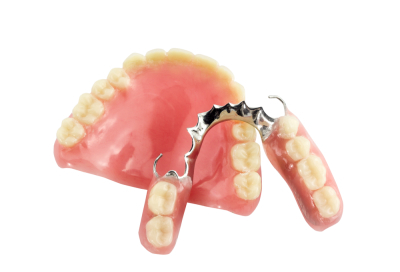 Complete dentures can also referred to as a full set and are a removable prosthesis. 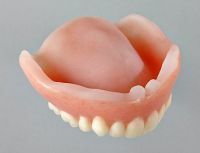 This type of denture is used when you are replacing all your natural teeth. Complete dentures are held in by suction from the roof of your mouth. 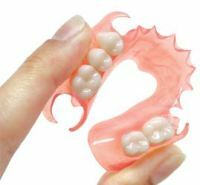 Complete dentures will take some time to get used to as you will notice your speech may change, the size of the denture may be differ, you could have an increased gag reflex and eating will take some getting used to again. Do you still have some, but not all, of your natural teeth? A partial denture replaces one or more missing natural teeth and is customized to a patient’s individual needs. Removable partial dentures restore a person’s natural appearance and greatly improve the ability to chew and speak clearly. With a partial denture you will look, feel and chew better. A cost effective way of replacing many missing teeth, dentures will be held securely in place by implants providing great improvement from traditional removable dentures. Implant retained dentures will completely restore your ability to eat and chew foods like you have before with your natural teeth. An immediate denture is an alternative to being without teeth during the initial six to eight week healing period after your natural teeth have been removed. An immediate denture is made by your Denturist prior to the extraction of your natural teeth. Your Denturist bases the immediate denture upon impressions made of your mouth before your natural teeth are removed, thus providing a denture solution that can give you a more natural look from day one. Your new “immediate” denture is inserted immediately after your teeth have been removed, thus avoiding the need to go a day without teeth. Immediate dentures protect sensitive tissues after natural teeth have been removed. This allows healing progress while keeping the gums free of debris that might cause irritation. Immediate dentures can help you transition from eating soft foods to a wider variety of food during the healing process. Soft liners are used to increase chewing comfort in new or existing dentures. Soft liners are bonded to the surface of dentures and rest on the oral tissues. The soft liner acts as a shock absorber between the hard plastic denture base and sensitive oral tissues covering the jaw ridges. If you are suffering with denture sore spots, speak to your Denturist about how a soft liner may help you. Your Denturist can often offer same day service for relines to minimize the amount of time you are without your dentures. Your Denturist can often offer same day service for repairs to minimize the amount of time you are without your dentures. All lab work in done in our onsite laboratory. Never attempt to repair or alter your dentures yourself. Improperly repaired dentures (with Krazy Glue) will not last long and may cause irritation due to the poor fit and have an adverse effect on your overall health. Repairs may be required when breakage or damage occurs, when one or more teeth need to be added to an existing denture (due to tooth extraction), or because of wear and tear. 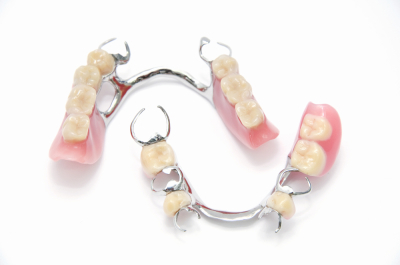 Often denture teeth and clasps can be added to existing partial dentures when natural teeth are lost. A proper repair requires addition of new denture base (pink) material to the repair area and may require an intra-oral impression by the Denturist prior to repair.Most repairs can easily be done in one day. If your denture requires a repair, it may indicate underlying problems associated with the age of the denture, worn teeth or poor fit. When it comes to sports equipment, mouthguards are essential. They are made of soft plastic and are closely adapted to fit comfortably over your natural teeth. Athletic mouthguards protect your teeth, lips, cheeks and tongue. They also protect you from a certain type of concussion. Teeth Whitening is a simple and effective process that lightens the shade of enamel and dentin of natural teeth. With the use of custom-made whitening tray and the latest in natural teeth whitening technology, you can have whiter, brighter teeth. The whitening process uses a peroxide-based gel retained in a custom-fitted appliance that is worn over your natural teeth. Your Denturist will determine if you are a suitable candidate following a thorough examination. Tooth whitening is ideal for people who have healthy, unrestored teeth and would like to have a whiter, brighter smile. It will not whiten dentures, crown and bridge, composite restorations, or natural teeth darkened by trauma, tetracycline or nerve degeneration. The whitening process is most effective on mildly discoloured teeth. Darker stains take longer to respond to whitening treatments. The degree of whiteness will vary from person to person, depending on the structure of the teeth and how long the whitening material is used. For some it may be hard to travel to and from our denture clinic and we understand that. We offer house calls from the comfort of your own home, nursing home or retirement home. Our Denturist will come visit you for a couple of appointments to take impressions and measurements to correctly fit your custom denture. All appointments can be arranged within your schedule, as well as your Denturists’. Educational material reprinted with permission from The Denturist Association of Ontario (DAO). Copyright © 2015 The Denturist Association of Ontario. All rights reserved.